Corion is a multifunctional platform hosted on the Ethereum Classic blockchain, designed for both businesses and individuals. Its creation was motivated by the truly revolutionary idea of bringing a coin with a stable price to the cryptocurrency traders who are tired of the constant fluctuations of coin prices on the crypto market. This is one of the reasons why it has already generated a lot of interest among traders and numerous major actors in the world of cryptocurrencies. Learn more about the Corion project and discover the benefits of becoming an investor in this comprehensive Corion review. The Corion team includes nearly two dozen dedicated experts led by Miklos Denkler, the CEO of Corion. The heart and soul of the project are Andor ‘iFA’ Rajci, Corion Core Developer and Attila Dancs, Corion’s blockchain business expert. Corion has managed to assemble an impressive team, with experts in a variety of fields, including Zoltan Bor, cryptocurrency expert, Gabor Gajdos, frontend developer, Zsolt Kukorelly Dr., algorithm advisor, Mate Tokay, crypto strategist, Endre Jobbagy, payment gateway advisor, Andras Lowy, social media and analytics expert, and many others. Corion stands for Capital Optimized Reward Incentive Online Network. The essential idea of the project is to create a decentralized ecosystem based on the blockchain technology, available to everyone who wants to participate in the building of a multifunctional platform characterized by speed, simplicity, and security, functioning based on mutual benefits and relying on a stable currency. The stability of the currency is ensured by a built-in automated inflation/deflation control system, with the amount of tokens released based on demand. As we have mentioned before in this Corion review, this is what makes Corion coins essentially different from all the other cryptocurrencies currently available on the market. It allows traders to freely engage in secure, instant transactions, without having to constantly monitor the situation on the market and worry about any major losses due to price fluctuations. The platform will allow all users in possession of at least 3000 Corion coins to become service providers and build their own businesses on the platform, enjoying the multiple benefits of operating within the innovative Corion network. Learn more in the following section of this Corion review. The advantages of the Corion platform can be clearly seen in its 7 major features. As suggested previously, it is perfect for building a business, with the Corion Marketplace providing excellent tools for business promotion and growing a customer base both online and offline. The stable Corion currency allows for unbounded distribution of products and services, providing long-term sustainability. Corion incentive-based daily reward system allows users to earn interest via service providers, without any deposits or pledging their coins. 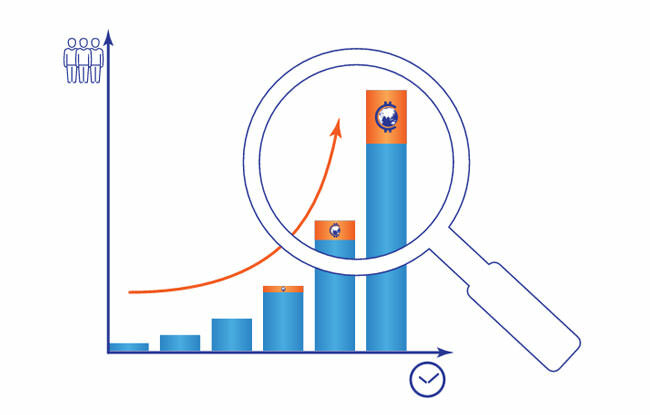 With the growth of a business, the demand for coins also grows, which further supports and fuels the Corion system and enables the distribution of daily rewards for user activity that can amount to as much as 2.5% release profit on a daily basis. Corion multifunctional wallet is the main interface of the Corion platform and allows for instant access to all features and incredible ease of use. 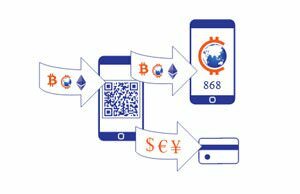 The wallet provides all the tools necessary for executing transactions in the most popular cryptocurrencies. The main goal is to facilitate the mainstream adoption of cryptocurrency usage in daily life. The built-in P2P exchange is based on smart contracts and prevents any potential frauds, with no intermediaries in the process. The initially available pair is ETC/COR, but the future development of this decentralized exchange platform promises to allow you to trade with fiat and numerous popular cryptocurrencies. Apart from the basic native cryptocurrency, Corion coin, Corion platform also offers Corion Premium, a token which allows users to become shareholders in the most successful ventures on the platform. This token will also be available on exchanges and has the potential to grow into a coveted portfolio investment token. Learn how you can get your hands on these rare tokens in the How To Contribute section of this Corion review. Finally, if you are interested in finding out about the Corion platform, you can take part in Corion Gamification. By playing fun educational games and engaging in entertaining activities, you can learn more about Corion while earning financial rewards. Corion Gamification was designed as another means of facilitating the mainstream adoption of Corion. The Corion ICO started on June 18, 2017 at 10:00 CEST and is scheduled to end on July 30, 2017 at 10:00 CEST. The creators decided to reward the early contributors with a 25% bonus during the first day of the ICO, a 20% bonus during the first week, a 15% bonus during the second week, and gradually decreasing bonuses until the end of the campaign. At the time this Corion review was written, which was two days after the ICO had been launched, over 1.2 million Corion coins were purchased by nearly 400 investors, with a total of more than $900,000 collected. The funds raised during the Corion crowdsale will be distributed in the following manner: 50% will go into further developments of the platform and future investments managed by the Corion Foundation, 25% will go into the Stability Fund, also managed by the Corion Foundation, 16% will go to the members of the Corion team for their 1-year work, 4% will go to the future developers and associates, and the remaining 5% will be used for building the user base and spent on marketing and promotions. You can participate in the Corion ICO by purchasing Corion coins at the price that currently amounts to 0.0003839625 Bitcoin per 1 Corion coin. 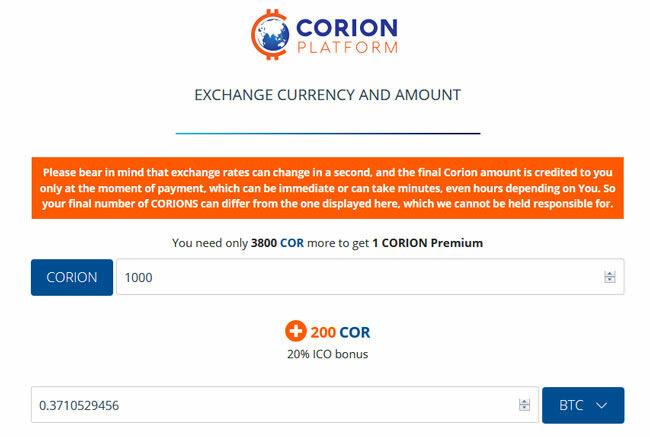 The minimum amount you can purchase is 10 Corion coins. For every 5000 Corions you purchase, you get 1 Corion Premium. You can pay using Bitcoin, Ethereum or Ethereum Classic. Keep in mind that due to the changes in the prices of supported cryptocurrencies, the total amount you pay may differ from the one initially displayed on the website. Once you get your Corion wallet, you can also contribute by referring other users and receive rewards every time a user you referred invests in Corion. For purchases made via referral link that amount up to 1000 Corion coins, you get 1% reward. For purchases between 1000 and 10,000 Corions, you get 2% reward, for those between 10,000 and 100,000 Corions, you get 3% reward, for purchase between 100,000 and 1,000,000 Corions, you get 4% reward, and for purchases of over 1,000,000 Corions, you get 5%. By reaching $100,000 turnover via a referral link, you can enter a strategic partnership with Corion and receive an additional 1-4% reward in either Bitcoin, Ethereum or Ethereum Classic. Corion is an extremely ambitious and attention-worthy project that promises to bring increased stability and security to its users and provide a good platform for building businesses and services. With a stable-rate currency and many innovative and extremely useful features, it could be the next big thing in the crypto world. We are definitely excited about it and hope that it will live up to its investors’ expectations.